A Silent Voice is a movie that accomplishes several seemingly impossible balancing acts at once. Characters that initially appear despicable are allowed some semblance of reconciliation in a narrative punctured with such sadness opposite moments of complete catharsis and joy. 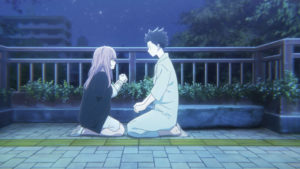 It feels like a film that could have so easily suffered from severe tonal whiplash, but A Silent Voice juggles multiple clashing elements wonderfully, expressing emotional highs and lows that feel incredibly grounded within its animated form. But before I commence this review in earnest, it’s important to mention the mature topics present in this film, as A Silent Voice deals with themes such as social anxiety, bullying, and suicide. However, it goes to those very dark places while simultaneously being a film filled with themes of love and characters who save each other from deep loneliness and sadness. With that said, let’s get into it. Shoya Ishida is a rambunctious elementary schooler with a cohort of friends, who spends his days playing games and swimming in the local rivers. 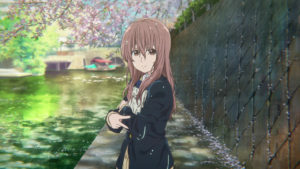 However, his carefree days end when Shoko Nishimiya, a deaf girl who communicates with a notebook, transfers into his class, and Shoya and several other children begin to bully her. The bullying escalates from the children simply ignoring Shoko, to making fun of how she talks, and eventually culminates in Shoya stealing and damaging several of her hearing aids. As the teasing continues, Shoko eventually transfers schools and the sole blame for her torment is rested on Shoya. 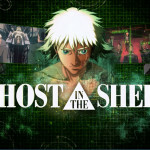 As the class scapegoat, Shoya is rejected by his once friends and left alone, friendless, and mocked by his peers from primary school all through high school. It is at this point that the older and now extremely socially anxious Shoya reunites with Shoko, and the two formulate a tentative but warm friendship as they try and decide how to relate to each other. But it’s never easy undoing past trauma, and Shoya must figure out how to bridge the gap between himself and Shoko, while also rebuilding his own sense of worth and decide how to live with a version of himself that might actually deserve happiness. 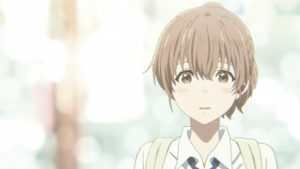 A Silent Voice is based on the manga of the same name that was written and illustrated by Yoshitoki Oima. 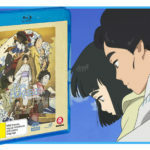 The film is certainly a love story (and a compelling one in its own right) between Shoya and Shoko as they learn how to relate to each other, but the reason it works so well is its various layers and use of grounded drama. In fact, one of the most powerful themes in the film is the way it examines bullying, and its depiction of how society and groups within it so easily fail vulnerable people. Shoko is deaf, and while Shoya and the other children intially accept her, it becomes so easy to turn on her when she requires different supports for her disability. For example, while Shoya’s schoolmate Naoka initially helps Shoko by writing down what the teacher says in class so she can actually understand what is going on, Naoka quickly grows irritated at having to do this and rejects Shoko’s presence. 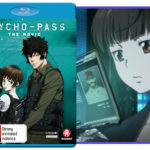 The other children also resist using Shoko’s notebook to communicate with her, and all but one child refuses to learn sign language to talk with her. Additionally, the film acknowledges society’s habit of creating convenient scapegoats, forcing blame onto an individual to absolve groups of their own wrongdoing. This situation plays out uncomfortably when Shoko transfers, and the children in Shoya’s class are confronted about whether she was being bullied. Shoya is about to admit to his part in the bullying when his teacher and fellow classmates declare that he is the sole bully in the class. 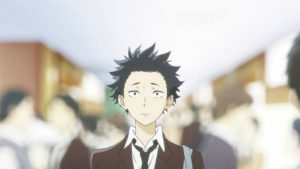 When Shoya rightfully points out that others also participated in the poor treatment of Shoko, he is completely ostracised by his peers and through a series of rejections and intense bullying, he develops severe social anxiety that keeps him from engaging with other people, to the point where he can’t make eye contact. 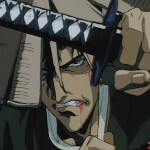 The film even goes as far as animating large purple crosses over other people’s faces to depict the severity of his condition. But it’s not all doom and gloom thankfully. 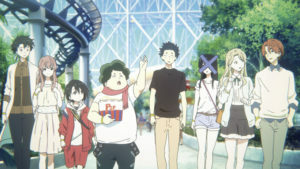 After reuniting with Shoko, Shoya finds friendship in the eccentric loner Tomohiro, Shoko’s sister Yuzuru, and even a complicated understanding with childhood classmate Naoka. With their help, Shoya comes to understand that it’s ok for him to befriend Shoko after all he did to her, and he can begin to forgive himself. In this way, A Silent Voice acts as both a warning and a reassurance. A warning of the self-loathing that can develop when the time isn’t taken to understand vulnerable people, and how people like Shoko can often be made to feel worthless and like a burden. But it ultimately acts as a reassurance, a wish fulfilment story about confronting mistakes and trying to make them right, and an acknowledgement that such things are possible. This is probably why the film resonates as well as it does. It certainly goes to dark places by exploring the circumstances in which people lose their sense of worth, experiencing such intense sadness that they no longer want to live. But the film also takes the time to examine how people can crawl out of those dark places, and ultimately heal from those experiences. It’s difficult to talk about animation in films like A Silent Voice, because there are only so many times you can use words like gorgeous and beautiful before they lose all proper meaning. So, I won’t talk about the lovely cinematography that uses empty space in framing shots, or the colours that shift depending on location and mood and depict the scenery so perfectly that summer shots seem to radiate heat. Instead, let’s focus on the stellar attention to detail that is the body and facial animation of the characters. It’s most noticeable in Shoya, his expressions, how he awkwardly holds himself, his posture, his hand movements. Everything about him screams discomfort and unease, and even if you take away the stellar voice work (both Japanese and English voice casts are great), it’s still obvious how painfully anxious he is in the way the animators have translated his physical body language. There’s something about the way that hand drawn animation ‘breathes’ that lends itself to the depiction of uncomfortable emotion the likes of which is depicted in A Silent Voice. It’s a testament to the quality of storytelling when the bully in a piece becomes a sympathetic character. When I first watched A Silent Voice, I proclaimed how much I despised Shoya several times because of how he treated Shoko. But in the end, Shoya is a product of an environment, not its catalyst. In the end, he occupies a space similar to Shoko, understands her loneliness and self-loathing because it has become his own. The film is an emotional ride, things ebb and flow into place, emotions spike and flatten. 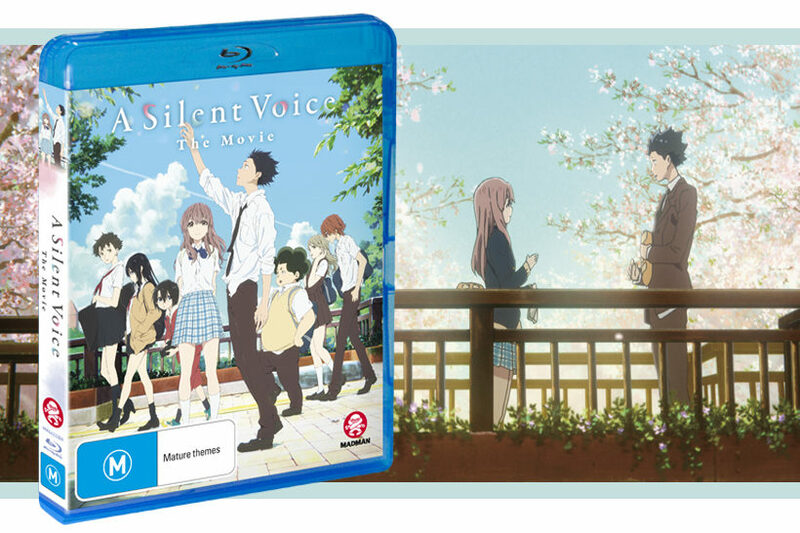 A Silent Voice a great film with a gentle heart, depicting people in their most vulnerable and strongest moments. It’s not a film to be missed.